UPEI students, staff, and faculty are you up for a challenge? Test your mental abilities alongside your fellow UPEI colleagues in a problem-solving fun experience – and, you won't be marked on it! 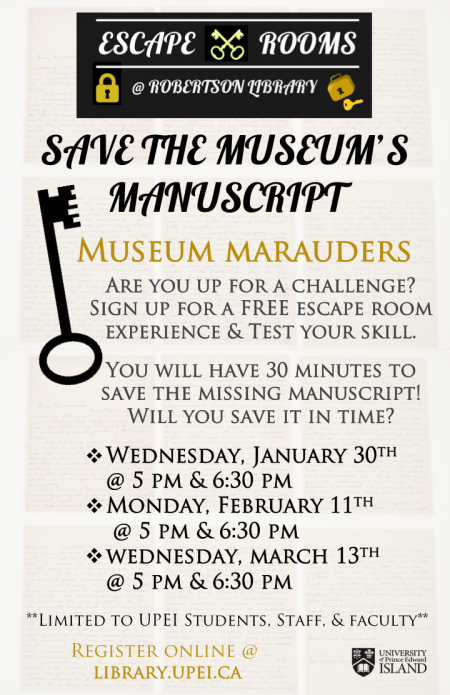 Robertson Library is presenting an escape room in the Library’s LINC, Room 265, this semester – Museum Marauders. The Gables: The Life of Lucy Maud Montgomery, a new museum exhibit showcasing the life of Lucy Maud Montgomery has been loaned a long-lost manuscript which has taken the literary world by storm. Alas! Last week an opportunistic researcher, Mr. Phillips, attempted to steal the manuscript to sell on the black market. We caught him just in time, but not before he locked it in a case and refuses to give us the combinations to the many locks. Being a dedicated Lucy Maud Montgomery research scholar, you’ll be able to find the combinations and keys to the locks within this room. But … Mr. Phillips has placed a time-released self-destruction device in the box, and we only have 30 minutes left on the timer! So you’ll need to act fast to save this piece of Canadian literary history! You and your fellow UPEI colleagues are locked in a room! Find clues, solve puzzles, find keys, and open locks to save the missing manuscript. You have 30 minutes. Can you find the manuscript in time? The Escape Room is limited to UPEI students, staff, and faculty and up to six participants per time. Free admission! Come and see if you have what it takes to escape! Don’t miss out!